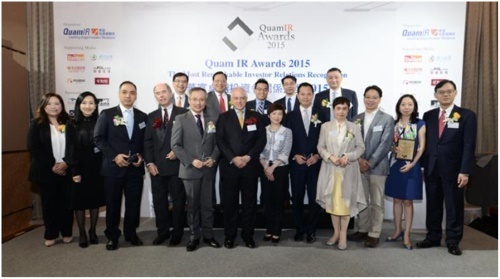 HONG KONG, May 25, 2016 - (ACN Newswire) - The award presentation ceremony of Quam IR Awards 2015 (QIRA) successfully took place on 12 May, 2016 at Four Seasons Hotel Hong Kong. Representatives of the awarded listed companies received the distinction and shared their joy at the ceremony. Eminent figures from the business community, notable guests as well as the local and Chinese media gathered at this splendid rendezvous. Quam IR Awards aims to honour models of practice and leadership in Investor Relations (IR) among the listed companies in the Asia Pacific region. Our winners have been devoted in upholding transparent communications between companies and stakeholders in the past year. The Quam IR Awards serves as the well-recognized testimonials to the winners' excellence, which can help bring accreditation and prestige to the winning companies and their remarkable achievement in the area of IR among shareholders, institutional investors, equity research analysts and financial media. Our winners come from various categories, ranging from Hang Seng Index Constituents, Main Board and First Year After Listing companies, representing multi-national enterprises to local companies. A total of 11 awards were presented, the winners include Bank of China Limited, CK Hutchison Holdings Limited, D&G Technology Holding Company Limited, Fortune REIT, Fuguiniao Co., Ltd., The Hong Kong & China Gas Co Ltd, K.Wah International Holdings Limited, Li & Fung Limited, New World Development Company Limited, Shui On Land Limited and Xtep International Holdings Limited. At the ceremony, Mr. Bernard Pouliot, Chairman of Quam Financial Service Group, said: "The Quam IR Awards is set up to identify and recognize the prominent IR efforts of list companies, and to encourage other members of the industry to strive for IR betterment. The demand for professional Investor Relations (IR) is on the rise as it plays a key communication role between corporate management and investment community." Meanwhile, Mr. Richard Winter, Deputy Chairman of Quam Financial Services Group, added: "All the awardees of Quam IR Awards 2015 demonstrate a commitment to Investor Relations. Their efforts do not only win the trust and confidence of their shareholders, but also contribute in advocating corporate governance by remaining accountable to the shareholders. They have all my respect and appreciation." Quam IR was honoured to invite Dr Carlye Tsui BBS MBE JP FHKIoD, Chief Executive Officer of The Hong Kong Institute of Directors; Hon Charles Peter Mok, JP, Legislative Councilor of HKSAR (Functional Constituency - Information Technology); Hon Dennis Kwok, Legislative Councilor of HKSAR (Functional Constituency - Legal); Mr Jeffrey Chan, Permanent Honorary President & Director of Hong Kong Securities Association and Advisory Committee Member of Investor Education Centre; and Mr Mike Wong, Chief Executive Officer of The Chamber of Hong Kong Listed Companies, as our guests of honor to witness the glorification of the listed companies demonstrated IR excellence. Dr Carlye Tsui BBS MBE JP FHKIoD, Chief Executive Officer of The Hong Kong Institute of Directors said, "As Hong Kong's financial markets become more complex and operate across borders, the awareness of good IR practices has been on the rise, the Awards is undoubtedly well-recognized testimonial to the excellence of the winning companies. The effort of IR professionals enables higher transparency in the investment community and enhances communication between companies and stakeholders." Hon Charles Peter Mok, JP said the Award Presentation Ceremony promotes the importance of good IR practices in the Asia Pacific region, it provides a platform to exemplify winning companies' perseverance in IR to institutional investors and individual investors. Hon Dennis Kwok emphasized that the awarded companies come from diverse categories, which proves that excellent IR stemmed from a company's desire to connect with their shareholders rather than confined to a certain type or size of listed company. Such devotion of IR elites contributes to Hong Kong's vibrant and competitive investment community. Mr Mike Wong, Chief Executive Officer of The Chamber of Hong Kong Listed Companies, said he was pleased to attend the award presentation ceremony. He added, "Best IR practices enable listed companies to maintain high standards of corporate governance through timely and transparent communications with their stakeholders." Meanwhile, Mr Jeffrey Chan, Permanent Honourary President & Director of Hong Kong Securities Association and Advisory Committee Member of Investor Education Centre shared "As Hong Kong's financial markets become more complex and operate across borders, it is increasingly vital that listed companies stay closely in touch with their stakeholders in order to remain competitive in the global capital market." In addition to a strong lineup of guests, the award presentation ceremony attracted numerous media and sponsors both in Hong Kong and China. Our supporting media partners include The Standard, Tencent finance, Eastmoney, CNFOL, 0033.com, Hexun and so on. Besides, several companies supported QIRA by offering products & prize sponsorship, namely EyeCare HK, FX Creations International Limited, Impact Original, Mission Hills Golf Club and Pharma Group Ltd. According to Mr Carl Wong, Head of Group Investor Relations of CK Hutchison Holdings Limited, CK Hutchison has maintained transparent communication with the financial sector, namely the analysts, fund managers and investors. In order to uphold transparency and accountability, CK Hutchison issues announcement and notices on a regular basis, and more financial data of the company has been disclosed in its Annual Report and Interim Results in the past few years. Besides, CK Hutchison has arranged "Investor Day" regularly to equip investor with a better understanding of CK Hutchison diversified businesses. Ms Glendy Choi, Executive Director & CEO of D&G Technology Holding Company Limited, shared that Quam IR Awards is the first IR-related recognition D&G Technology has won, and it means a lot to them. Ever since D&G Technology has become a listed company, they have always been devoted in IR, and they have been actively engaging with investors and potential investors by remaining highly transparent. To enhance a better understanding of the company's strategies and development, they have published their first sustainability report in accordance with HKEX's guidelines this year. Ms Jenny Hung, Director of Investments and Investor Relations of Fortune REIT shared, since Fortune REIT is dual-listed in Singapore and Hong Kong, Fortune REIT needs to comply with the stricter requirements on REIT of the two regimes and thus a higher standard of corporate governance over other peers. Besides, Fortune REIT values the opinion of Unitholders in both Singapore and Hong Kong. For example, Unitholders in Singapore can participate in the AGM or EGM hosted in Hong Kong through video conference, in which every participating Unitholder can raise questions or share their opinion at the meeting. Mr Wilson Chan, Chief Financial Officer of Fuguiniao Co., Ltd said winning the Quam IR Awards is the recognition of their IR effort on one hand and an encouragement for IR betterment in another. Fuguiniao will focus on integrating the existing stores in near future, it will also set up e-commence team to coordinate development of Fuguiniao's diversified product portfolio. This will accelerate the development of Fuguiniao's overseas business and promote its A-share listing in full pursuit. Mr. WK Lo, Head of Corporate Investment & Investor Relations of The Hong Kong & China Gas Co Ltd (Towngas) shared that, in addition to communication with investors in major international financial centres, Towngas has more IR engagement in Mainland China due to the rapid development of city-gas business in China. Besides, since institutional investors are becoming active in China, Towngas has hosted IR Meetings in Beijing, Shanghai, Shenzhen in order to engage with them and equip them with information about Towngas's business in the Mainland. In the meantime, Towngas has uploaded information to the official website for investors around the globe. Mr. Charles Wong, Associate Director of Corporate Affairs and Special Projects of K.Wah International Holdings Limited said, the Quam IR Awards has recognized K.Wah's effort in maintaining high transparency and excellent corporate governance. K. Wah will launch 7 new projects in Hong Kong and Mainland China in 2016, including renowned "The Spectra". It will stay connected with investors through various channels and bring long-term returns to its shareholders. Ms Michelle Sze, General Manager & Head of Investor Relations of Shui On Land Limited said, Shui On has not only published Annual Report to HKEX website, but also upload Powerpoint and Live Video of Results Announcement to the company website, so as to ensure that investors can get information on a timely and equally basis, regardless of the geographical boundary. Management of Shui On Land Limited keeps in touch with institutional investors and analysts regularly. To promote the latest development of the company, Shui On Land Limited also hosts site visits and open days of projects from time to time. According to Mr Terry Ho, Executive Director, CFO &Company Secretary of Xtep International Holdings Limited shared, Xtep communicates with investors mainly through at least four channels to ensure the company's messages are delivered in an accurate and timely manner. The channels include one-on-one meeting with investors, attending bank organized conferences and roadshows, publishing press release and notices for company's latest news, and arranging interviews with media. Xtep attends approximately 12 conferences and roadshows annually, and engages with 10-30 investors during each conference. Xtep believes this is an efficient way to communicate the investment community.